Print: Hōnō (Offering 奉納). 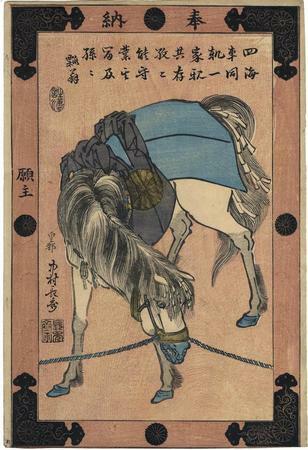 A votive picture of a horse (ema 絵馬). A votive picture of a horse from a deluxe edition with metallic pigments in saddle. "Ema (horse pictures 絵馬) are votive paintings offered at shrines and temples for fulfillment of wishes, in thanks for answered prayers, or for taking vows. The custom might have originated in some early Shinto and folk traditions or ritual practices whereby horses, which were seen as carrying messages from the gods (kami 神), were sacrificed or donated to transmit pleas for relief from droughts or famines. Horses, however, were essential and very expensive, so by the Nara period (710-794), models in clay, wood, or paper were used. In the Kamakura period (1185-1333), paintings increasingly served as ema. By the Tokugawa period (1603-1868), most votive paintings were done on wood and the subject matter expanded to include more than horses, among them deities such as Kannon and Jizu, or specific iconography depending on the intended purpose. With its simulated wood frame sporting elaborate metal mounts that enclose a field of pink wood-grain, this type of design is rare. Although a few examples with similar backgrounds are known for actor portraits (Lyon's Utaemon III by Hokushu ), kamigata-e featuring votive horses are virtually unknown. "... The artist signature is interesting, as it includes not only an indication of his place of origin (Kyoto 皇都) written in smaller characters, but also his family surname (Nakamura, 中村 sometimes found as 中邑). The inscription along the top (signed Hisago Okina? 瓢翁) has the following Japanese text: 四海車同軌一家祝共 存放々能守業互富及孫々. The two characters in the left margin read ganshu (petitioner: 願主), referring to someone who offers a petition to a temple. This design was intended to be displayed and used as a votive image, which probably explains why almost no impressions have survived. ..." quoted from OsakaPrints.com Horse picture (ema 絵馬).